Self-Absorbed Boomer: Oh, to be a Brooklyn Dodger! Oh, to be a Brooklyn Dodger! The baseball team was at one time called the Trolley Dodgers (and before that the Bridegrooms; see here) because of the dense network of trolley lines that traversed Brooklyn a century ago, some of which lasted into the 1950s (see photos here). The trolleys pictured above sit forlornly on track between the water and the nineteenth century Red Hook warehouse building that now houses a Fairway market. 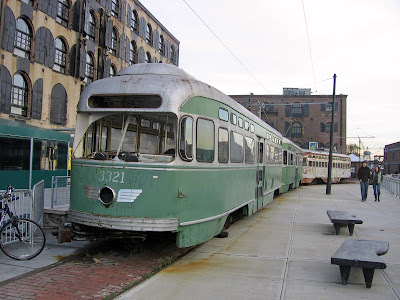 The two nearest cars, which are of the PCC type actually used in Brooklyn before the last of the Borough's trolley lines shut down, were acquired as surplus from the Boston MTA's "Green Line", but have been repainted to match the color scheme worn by their erstwhile sisters in Brooklyn. The white car at the rear is of German manufacture and is on lease from the City of Oslo. These cars were acquired by Bob Diamond, whose plan to restore trolley service along the Red Hook waterfront was thwarted by city bureaucracy. You can read the story here. Update: Topazz says that, if a movie is made about the Red Hook trolley story, I should get the Jeff Goldblum part. I see that Jeff and I are both natives of western Pennsylvania. Nevertheless, he has a lot more hair than I do. very interesting post, I read the link too. If they ever make a movie out of this effort, I say you get the Jeff Goldblum part. odd...my comment above doesn't link to my current account, or blog. I didn't even know that account existed. A note to a reader in San Francisco.